American football league allowed St. Louis Rams to relocate to Los Angeles, effectively meaning the team will build the new Inglewood Stadium. Situation of San Diego Chargers and Oakland Raiders is less clear. Yesterday saw crucial debates and voting on the future shape of the NFL and gave some answers in the decade-long issue of who will play in Los Angeles. As a reminder, three teams were bidding to relocate there: St. Louis Rams, San Diego Chargers and Oakland Raiders. A long day of votes and re-votes ended with 30 of 32 NFL owners approving Rams owner Stan Kroenke's plan to move his team from St. Louis to the site of the old Hollywood Park racetrack in Inglewood, California. 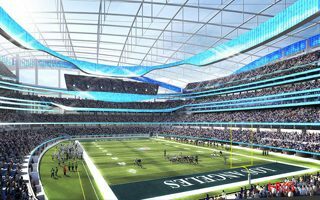 Kroenke still has to pay $550 million for the relocation, but a much larger burden will be building the new Inglewood Stadium (above). It’s currently priced at $1.86 billion, which makes it the most expensive stadium to be built. Enabling works on site are ongoing, just like consultations with local community. Rams’ decision effectively means that the proposal of building new NFL stadium in St. Louis (above) is dead. Already in the 2016 season Rams will play in Los Angeles, temporarily using the LA Coliseum with over 93,000 capacity. San Diego Chargers didn’t get equally strong approval, but were awarded the option to join Rams in Los Angeles if they choose to do so. If Chargers stay in San Diego, they could be replaced in Los Angeles by Raiders, the third team applying to move. This decision by NFL spoils plans by Chargers and Raiders who previously launched a stadium-share plan. They were to build a new NFL arena in Carson (above), but both franchises would need the approval in order for the scheme to work. Most likely the stadium will fall through now, though none of the two teams wanted to give any definite statements yesterday. If Chargers decline to move to LA, they still have a proposal by the city of San Diego to build a new NFL stadium in Mission Valley (above). Raiders don’t have such comfort, but the city of Oakland asked for more time to deliver a new stadium proposal as well.